Drought Smart Plants reply: This is one of my all time favorite little plants, and judging from the sales when I take plants to a show, everyone else loves it too - there are two that are similar, but both are Haworthia. This one is most likely of the fasciata species, but the other one, attenuata, is so similar that it's impossible to tell them apart without growing them side by side. The orange discolouration is caused by too bright of light - although they look like Aloe, and are actually related, they dislike full sun, instead are happier in bright filtered light, and also require a bit more moisture to look their best. 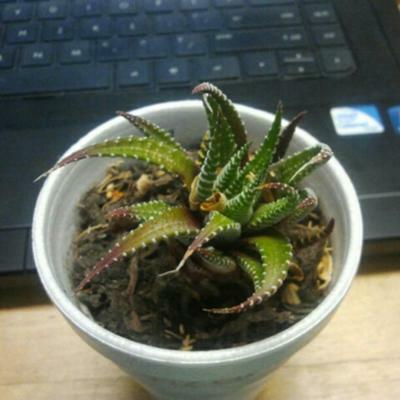 See more about these great little plants here: Haworthia.